CodeOperator has released a new version 1.3 for its DelayPack. This release includes two new delays, COTapeDelay and CODirtyDelay, and fixes several bugs in the other five delays. 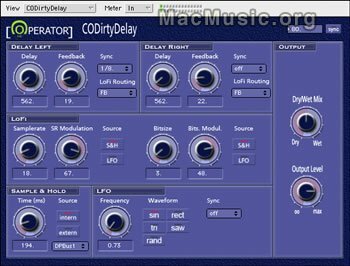 DelayPack is a Package with very usefull DelayPlugins made with Pluggo-MAX/MSP from cycling74, and includes COSimpleDelay , COSpectralDelay5, COModulationDelay, CODuckingDelay and COPingPongDelay. Details and download in our Software sectiion.